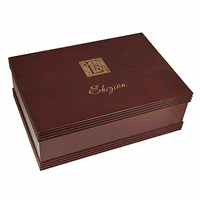 A great gift for a busy professional or to mark a special occasion, this personalized desktop keepsake box features a satiny smooth cherrywood finish and a soft black velour-lined interior. Perfect for stationery, small accessories like paper clips, staples and memo pads, it will keep your desk or tabletop looking neat and orderly. 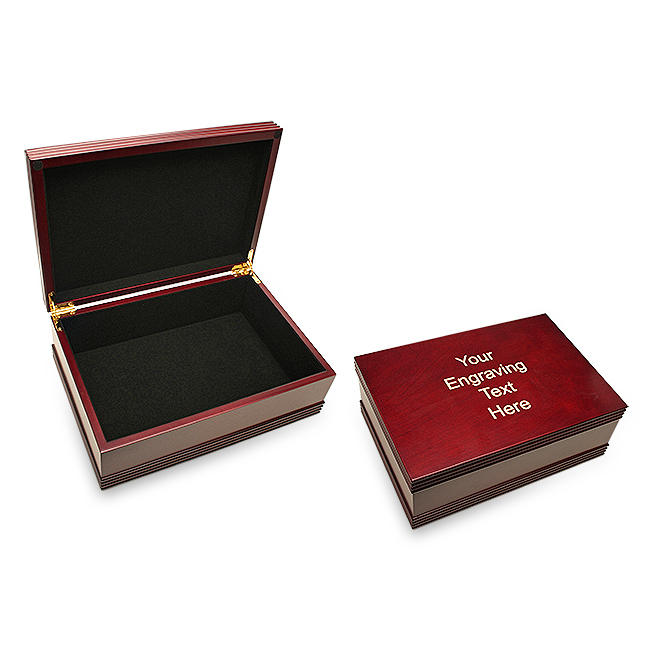 You can add a personalized finishing touch to the lid with the laser engraving of your choice free of charge. This personalized desktop stationery box will be a welcome addition to any desk or table and the customization will make it a cherished keepsake. Dimensions: 11 1/2" x 8" x 4"
Is the engraving in gold? The engraving is tan. We laser engrave the top layer of cherry finish away, to expose the lighter wood underneath. 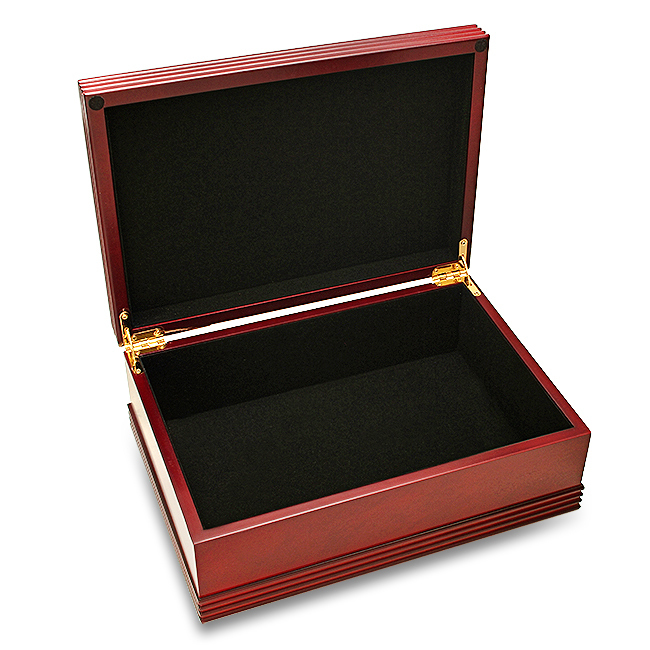 Since the box is not made out of Rosewood, how many years the finish will last? It really should last forever. is this box made out of rosewood? . . . or is it a veneer over a different wood . . . if so, what is the base wood? It has a rosewood finished veneer over composite wood. Can you tell me dimensions of the interior of the box? The dimensions of the inside are 10 1/4" x 6 3/4" x 2 3/4". Can you engrave a logo? We can engrave a logo. You can email us the logo at help@executivegiftshoppe. If you have it in black and white adobe illustrator .eps format, that would be best. If not, a black and white jpeg should work. We'll email you back a proof and quote. Do you have a smaller version of this box? How and where is the personalization of the box done? Any chance you could post a picture of an example of the personalization? Thanks! We don't have a sample of the engraving, sorry! The engraving is done by laser and its done on the lid. If you check the Personalize It button, you can enter your engraving and choose a font and font size and preview what it will look like on the lid. The preview is in black and white so its not exact but it will give you an idea on sizing. 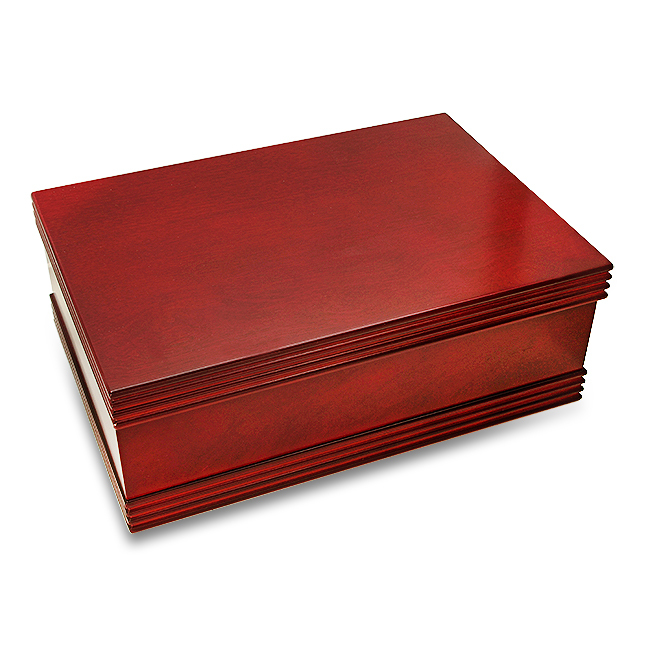 I really like the look of this keepsake box, but is it large enough to store average sized cards? The dimensions of the inside are 10 1/4" x 6 3/4" x 2 3/4" so it should work just fine for that purpose. To be sure though, measure the length and width of the card type you're looking to hold inside. We purchased this box for our adult son's birthday. It is a beautiful box for keeping memories and the personalization was perfect. We could not be more pleased. We received the box quickly and well-packaged. We have been very pleased both with the products and the service we have received from Executive Gift Shoppe. This is an elegant, well made box. We had it engraved and gave as a retirement gift. We were very pleased with the box and it arrived very quickly. Thank you for the excellent product and service! I purchased this keepsake box for my son�€™s 14th birthday, and he loves it! It�€™s the perfect size, and the engraving was just as I envisioned. Thanks so much!!! It's hard to shop online. I am a see it and touch it kind of customer. Therefore, I was immediately impressed with everything from the customer service to the final product arriving at my door. The handi-work is beautiful and elegant, not fancy. This would be in the way that an all around kind of guy would love. A Mans' man - if that makes any sense!! First, the box. Very nice looking box. The hinges seem well made and work well. The felt inside is thin and keeps objects from getting scratched. The engraving was done accurately and looked sharp. The box shipped within a couple days and arrived within a week. More important in my opinion is the customer service. The box was damaged while being shipped by the postal service. I emailed executive gift shop on a sunday and they shipped me out a new one monday free of charge. I will always recommend this company to everyone based on a great product and excellent customer service. 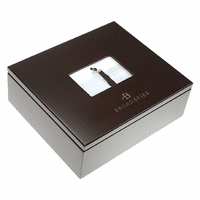 The ability to personalize these boxes made them the perfect executive gift. We ordered four of these as gifts. The processing time and shipping was very quick! The boxes are very nice, and the engraving looks great! The staff are very friendly and helpful. This box was the perfectl gift for my brother-in-law's retirement! The engraving was beautiful. It shipped fast and came nicely packaged! Thank you! I called with some questions on the product, customer service was very helpful! The box arrived beautifully engraved avd quickly. Very nice! This keepsake box is absolutely beautiful. The box itself feels solid and luxurious. Everything about the workmanship is excellent: The corners are perfect, the hinges are aligned and operate smoothly, the lining is perfectly snag- and wrinkle-free, and the lid stays upright until it is gently lowered. Our hard-to-spell name was perfectly rendered, and the Old English font is both clearly legible and lovely. It may seem a bit expensive for what it is, but now that I see it in person, I'm so glad I went with this keepsake box over the cheaper--and cheaper-looking--options on the market. All in all, this box surpassed my expectations, and I cannot wait to gift it to my daughter. Highly recommended! Love the box and the personalization came out perfect. We ordered on a Monday and received it by Friday. I highly recommend this gift. Very attractive & great price! We used to order a keepsake box from another company until they discontinued it. This box is much more attractive, and larger for nearly the same price. The personalized engraving makes it a great anniversary gift and we have gotten several compliments on it. We have been very happy with Executive Gift Shoppe! recommend this to anyone looking for something elegant, sturdy, and very attractive. This box was beautifully done. The engraving was perfect and I was impressed by the quality of the box itself. I received it only a few days after ordering and was completely satisfied.